Wyoming lines up to run a play late in the fourth quarter against Gardner-Webb. Laramie, Wyoming – The Wyoming Cowboys (1-1) bounced back from their opening game loss at Iowa with a 27 to 0 win over Gardner-Webb (0-2) out of the Big South Conference. The game was the first home contest of the 2017 season and a crowd of 19,051 was in Laramie on a warm but pleasant day. They went home pleased thanks to the offensive exploits of QB Josh Allen and WR Austin Conway and a very solid team performance defensively against the option based Bulldogs. Wyoming recorded their first defensive shutout since the 2010 season when they defeated Colorado State 44-0 in a season ending Border War contest. Individuals who stood out defensively included defensive end Kevin Prosser who recorded 9 tackles and 2 sacks (a career high), DT Youhanna Ghaifan who was a presence inside all day making 7 total tackles and the reliable safety Andrew Wingard who had 6 tackles and an interception. 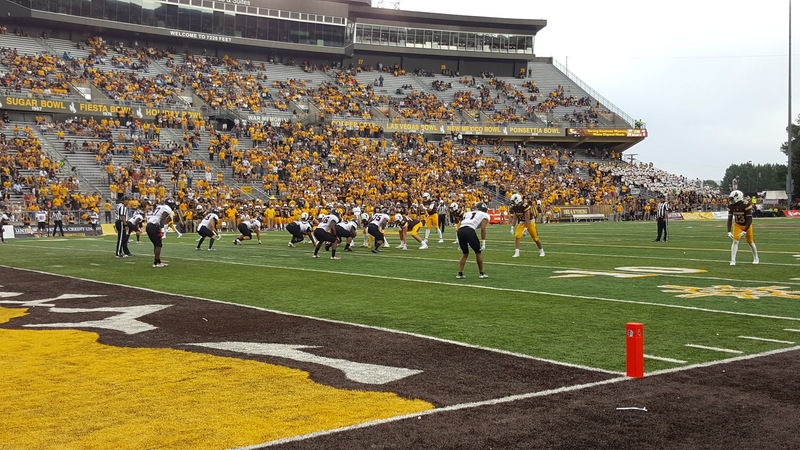 This shutout will come in handy later in the season when Wyoming takes on Air Force and New Mexico, two Mountain Division conference foes who also run the option. Wyoming should have plenty of confidence in playing the assignment based defense it takes to stop the option against the Falcons and Lobos having already faced an option oriented team. The offense wasn’t flashy but was efficient especially in the passing game that saw Josh Allen complete 68% of his passes. Allen’s top two wide receivers Austin Conway and C.J. Johnson both passed the 100-yard receiving mark in the first half. The first half is also where Wyoming did most of their offensive damage scoring 24 points on a Kellen Overstreet one yard run, a 27 yard Allen to Conway pass, a 28 yard Allen to Johnson pass and two Cooper Rothe field goals. Wyoming’s only score in the second half came on a 29-yard field goal by Cooper Rothe with 4:40 left in the game. The run game did struggle for the second week in a row and the Pokes only gained 65 yards on 28 carries for a 2.3 yards per carry average. Coach Bohl described the running game as, “abysmal for how we typically run the football.” Kellen Overstreet lead Wyoming in rushing with 33 yards on 14 carries and starter Milo Hall only had 13 yards on 10 carries. The running game was searching for answers so much that true freshman Trey Woods who practiced at linebacker throughout fall camp was moved to running back just this week and got two carries for fifteen yards in his first action playing the position at the college level. The Cowboy offense is looking for their identity and Craig Bohl says, “We have to be more balanced.” Balance is difficult though when you don’t have a clear number one running back and a mobile quarterback who can make all the throws. Wyoming may rely on the arm of Allen more than they actually want to until the running game can become as productive as Coach Bohl wants it to be. It will be interesting to see how the Wyoming offense evolves over the next few games as the coaching staff breaks down the tape and decides how to best utilize their roster. On the other side of the ball, the good news is the defense seems to have an identity and are much improved over last season. The unit has had two positive performances in a row under new defensive coordinator Scottie Hazelton who has simplified the defensive system for the players to go out there and make plays. The defense will be put to the test next week for sure so stay tuned. Wyoming suffered no major injuries during the game with a minor thumb injury to sophomore LB Cash Maluia (which he played through) being the only injury reported after the Wyoming victory. The Cowboys will host the Oregon Ducks out of the PAC-10 in a 5 pm MT kickoff with television coverage on the CBS Sports Network.